The C Fund has recently produced a lot of millionaire TSP participants. 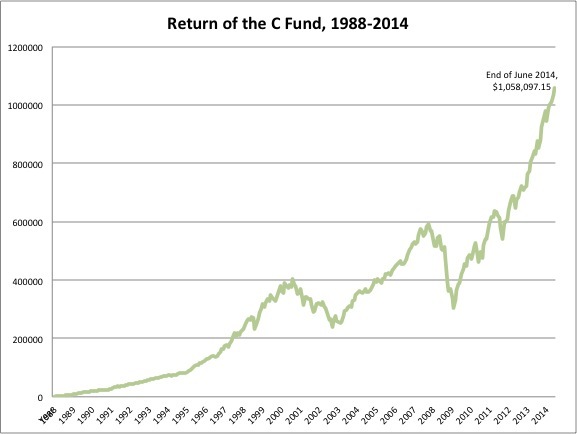 Those TSP participants who started investing in the C Fund at its inception in 1988 have become or are close to becoming millionaires this year. Those who contributed the maximum deferral limit from their pay each year and collected the government match are in even better shape (for example, contributing the maximum $17,500 plus the government match of 5% of salary last year and again this year). Finally, for those who contributed the maximum deferral limit plus additional “catch-up” contributions (which reached $5,500 in addition to the $17,500 deferral limit last year) allowed for those over 50, well, they’re doing really well. Click to the TSP Stats page to see how the other stock and bond funds have performed since their inception.